This is the list I have for now.. I will be adding no worries. I finally got my diploma! Wohoo! I am officially a college graduate! It feels so good. I was nervous opening up my diploma and then when I opened it up it was such a great feeling to know that I have accomplished something big in life. Now I am just waiting for forms back from BYU-Idaho so I can apply for my Utah teaching certification. Hopefully it won't take long. Once I get that things will hopefully be getting better. I am nervous for finding jobs here. I have heard 4 districts in the Vally are cutting back teachers. I am really hoping that the school I student taught at will hire me. I am subbing there quite a bit- thank you for those who fasted with me a couple weeks ago work is picking up. Last week I subbed at my school I student taught a couple days. One day I went in in the afternoon for a Kindergarten teacher and was talking to her before she left. She told me she was excited that I was her sub and that she heard I was a good teacher (I have never talked to her before in my life). So I know that I am being talked about at my school and I know the principal loves me. The teacher also told me there should be a couple openings for next year. Keep your fingers crossed. I would love to work at that school. The kids love me, I love them and I love the staff and the school. I am just hoping it works out! I should find out I think by the end of April! As far as the rest of life goes, I am doing well. I moved in with a friend and it has been so good. She is going through a really hard time in her life right now and I am so glad I am there for her! I love her and am so glad to have her in my life! I love my ward and the good friends that I have made here. It is nice to be close to my family and see them whenever. Life is great. I love my friends! 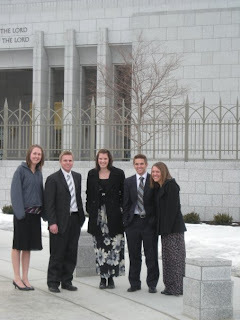 For the past month my friends Becky and Kelsey as well as myself made a goal to go the temple once a week. So far so good! 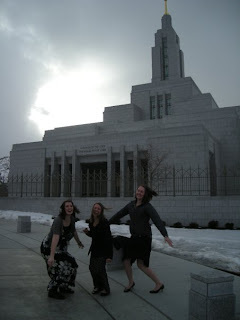 We also decided to try to get to all or most of the temples in Utah. As of today we have been to 3 of the however many there are. 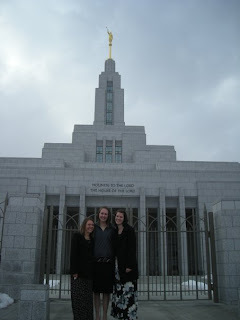 We have been to the Salt Lake (many times), Jordan River (which reminds me of the Seattle temple), and the Draper temple. After we went to all of them we decided that we should get pictures at them as well. So last Sunday we got two of our guy friends to be our photographers and headed out to the Draper temple and got pictures. I am so glad that we have made this choice. It has been such a blessing in my life and such a great way to feel our Saviors love. I am grateful for the temples and the blessings it brings and that I am able to be worthy to go and do baptisms for the dead. I look forward to the day that I can go and get my endowments out.